He studied in Paris at the École des Beaux-Arts and the Académie Julian (1911-1917). He participated in the Greek-Turkish War in Asia Minor, where he depicted war events; these paintings were lost during the Greek army’s retreat, after having gone on display at the Zappeion Hall in Athens and in Smyrna. He was a founding member of the ‘Techni’ group of artists and chairman of the Association of Greek Painters. 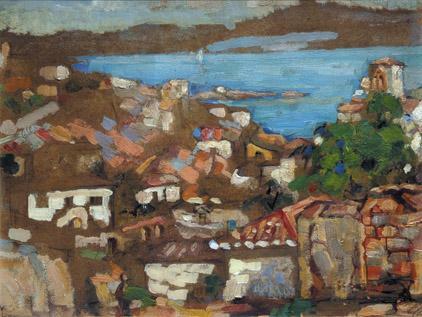 In 1928 he participated in the organisation of the art club Atelier (later known as the State Art Centre), and in 1934 he established, jointly with Aleka Stylou, the first private painting school in Athens. 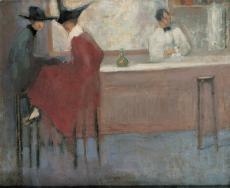 He participated in the Venice Biennale (1934) and the Paris Exposition Universelle (1937). In 1939 he became the director of the Athens School of Fine Arts annexes on Hydra and in Delphi. He also worked as a cartoonist and stage designer, employed from 1930 at the National Theatre of Greece. His early work – mostly depictions of urban life, but also portraits – was influenced by French painting; landscapes gradually prevailed.